This suit is a little long in the body for me, but the colours are beautiful and i’ll Just wear it like it is ‘rushed’. 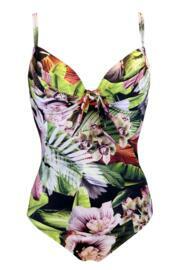 Beautiful swimsuit and exceptionally well made. Very good quality - however I ordered 2 sizes and both were way too long in the body, could fold over the fabric a few times, so had to return. I am 5ft 5ins - it would be perfect if you are taller I think. Good quality and fits really well. I have a long body so I usually find it quite difficult to find a costume that fits comfortably but this was perfect. 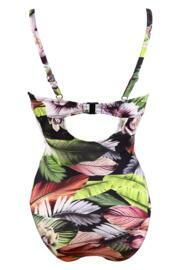 I love this swimsuit! After having 2 girls quickly one after the other my body is not quite where it used to be but this swimsuit is so flattering and comfy and the material and pattern is beautiful! It has given me a confidence boost ready for my family holiday! My wife ordered the orchid luxe in 34DD but it was a little tight, she was worried about returns but found they were free and you could exchange for a larger size which she did and it fitted her perfectly.